The Olympic symbol of five interlocking coloured (blue, yellow, black, green, and red) rings was adopted at the Olympic congress of 1912. Due to First World War, the Olympic games were not held in 1916 and the Olympic rings were displayed for the first time ever, on a flag, during the 1920 Olympiad in Antwerp, Belgium and then again, on a flag, at the 1924 Olympiad at Paris, France. 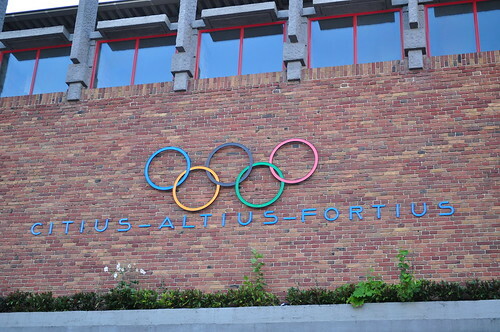 The first ever Olympic rings, in physical form, were displayed on the entrance to the 1928 Olympic Stadium at Amsterdam and also on its Flame tower. These rings are therefore the oldest Olympic rings in existence. Incidentally the modern day Olympic flame was lit for the first time during the 1928 Amsterdam Olympics on a specially built Flame Tower known as the Marathon tower. 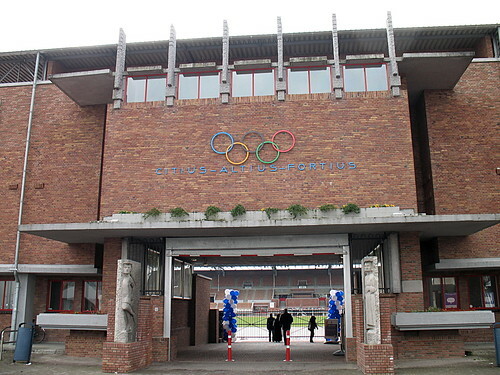 Both the Stadium and the Tower are now listed as National Monument of The Netherlands. View location in Google Earth / Google Street View - Close up of the Rings / Google Street View of Flame Tower. Credits: I am thankful to 1200ab, member, Google Earth Community Forum, who sent me a story about these Olympic rings. Thank you AB.